The 2018 edition of the football world cup has brought with it a renewed bout of hand wringing over ‘simulation’, e.g. players falling, diving, and tumbling under imaginary fouls, rolling around in mock pain, or clasping their faces pretending to have been hit. 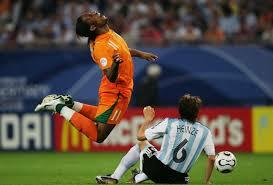 Stuart James writes in the Guardian that “play-acting has been commonplace at this World Cup. It’s become a cancer in the game, not just a stain on it, and Fifa needs to find a cure.” But what exactly is wrong with this behaviour? Why is the rise of this behaviour ‘a cancer in the game’? If you’re like me, you experience a mixture of nega tive emotions when, for example, Neymar writhes around like a freshly caught fish after relatively minor contact. But are these emotions and the associated intuition that simulation is wrong justified? One aspect of our negative response to the melodramatic expression of pain or the excessive tumbling after losing footing is that it is so clearly hammed up. The assumption that this poor acting would fool us is insulting to our intelligence. We are sufficiently familiar with physics to know you could only tumble that far if you were contributing to the tumble. 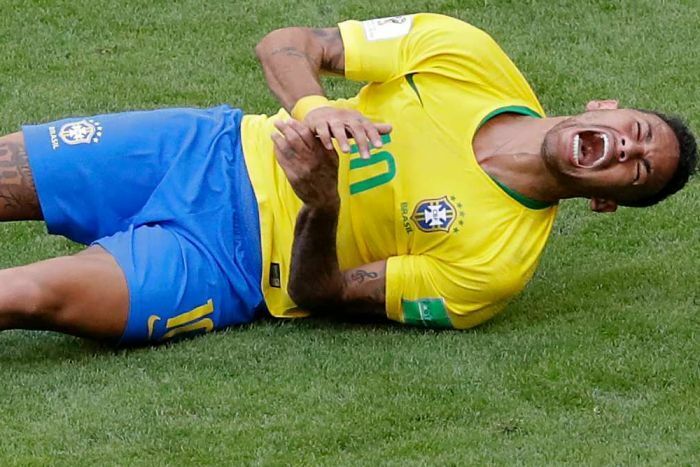 Likewise, we see Neymar respond normally to pain in other circumstances so we don’t believe he genuinely feels so much more pain when there is the chance of getting a favourable call from the referee. In any case, people in intense pain don’t move like that. But these complaints about the quality of acting involved might misread what’s going on. The melodrama isn’t about fooling us; it’s about influencing the referee. The acting seems obvious to us in slow motion replays (and no doubt referees are aware of it sometimes) but perhaps these behaviours have evolved according to how well they work. It’s difficult for the referee to keep track of everything going on, so the melodrama may have evolved as the best way to grab the referee’s attention and/or to make the strongest appeal for justice. The melodrama might even have some of the desired influence on the referee’s judgment even when the referee knows the act has been exaggerated. So I think that we are wrong to take offence at the bad acting involved because in simulation the footballer is not aiming for an accurate portrayal of, say, pain. Another aspect of our negative emotional response to simulation has to do, I think, with our cultural norms of how pain should be expressed. In many (if not all) cultures there is value placed on restricting your expression of pain. It’s part of being an adult that you can manage a degree of pain without making a fuss and that you don’t fake pain to get what you want. A lack of control over one’s expression of pain displays vulnerability and the need for sympathy and comforting. Faking pain to get what you want is a bad habit that we train children to avoid. 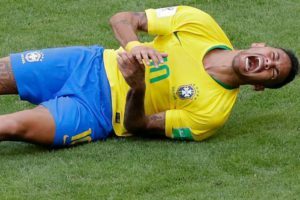 So when we see Neymar breaking these norms of pain expression we feel it is not befitting of an adult. He is prepared to undermine his status as a competent adult in pursuit of winning. Surely a virtuous person would never prioritise winning over being a competent adult and so Neymar should feel ashamed of simulating pain. The intense competition that one has to go through to become a top footballer might explain how such distorted hierarchies of values develop. Alternatively, these people may not feel their status as an adult is threatened because the huge sums of money they make allow them to maintain desirable public images despite these petty displays of vulnerability. Or, they may be massive ego-maniacs who just don’t care about the opinions of others and prepared to do whatever it takes to get what they want. Whatever the explanation, the hierarchy of values revealed in acts of simulation are undesirable and we should exhort those who simulate to be better people (not just because they are role models but for their own sakes). A third possible justification for our emotional reaction to Neymar is that simulation is immoral. Just as you shouldn’t harm others on the football pitch in order to win even if you can get away with it, you shouldn’t lie in order to win even if you can get away with it. However, I don’t think it is so clear that simulation is immoral. There are kinds of game where deception is built into the game (e.g. bluffing in poker) and so perhaps deceiving the referee could be part of the game of football. If he catches you then he gives you a yellow card but that doesn’t mean you shouldn’t try, that just means there is a risk as well as a possible return. The final justification I will consider for some of our negative emotions towards simulation is the most commonly heard – simulation is not part of football. Simulation is about trying to fool the referee. Maybe some people would like to watch a game of ‘fool the ref’ but we want to watch pure football. Players who contribute to ‘fool the ref’ infiltrating football are undermining the game or changing it and they are wrong to do so. Hence the claim that simulation is a ‘cancer in the game’. To make this judgement one has to be committed to a form of football essentialism, e.g. football is essentially trying to score goals while not conceding goals without using your hands. It also entails the value judgment that ‘pure’ football is one of life’s goods and it is better than football with simulation. Those who undermine ‘pure’ football are undermining one of life’s goods and so we are right to target them with moral opprobrium. Some might argue that a version of football with an aspect of ‘fooling the ref’ is a better form of football than ‘pure’ football. If that’s true, then the rise of simulation might not be a cancer but a beneficial evolution of football (or if we have a deep disagreement here, we could develop two different forms of football). However, it seems that the majority agree that ‘pure’ football is the best form of football so we should resist the infiltration of simulation. We are, therefore, right to feel anger and disgust towards acts of simulation because each act erodes the good that is pure football and it erodes the simulators’ status as morally competent persons. But we should not get too worked up about the poor quality of acting involved in simulation – it is probably just a function of what the player believes will successfully influence the referee. 3 Responses to What’s Wrong With Simulation in Football? I like your post! But I wonder if your first and last points contradict themselves. The acting is so bad that it is unlikely the ref is also fooled- he should be in fact be less fooled than the average person, given his experience and expertise. The acting could be a physical version of phrases like “I feel like death warmed up”, not intended to be literally true, or to be taken to be true, but to express the emotion of the player and elicit an empathetic response in the other person even while they in fact understand its true meaning perfectly well: you have a bad cold for the phrase and feel you were treated unfairly/ fouled for the dive. I actually don’t think it is wrong, especially in the context that their bodies are their whole lives- *this* foul might not have hurt or injured, but another similar one slightly mistimed could end their careers. So it is reasonable to expect fouls to be taken seriously and to ramp up the emotional cost to the referee of letting them slip by. Nice post Doug. Surely the main thing that is wrong with ‘fooling the ref’ is that the faker is not only trying to get a free kick but also get another innocent player a red card. That is what is wrong – that a professional whose livelihood depends on performance is eliminated on the basis of a lie. It is harm to the other player that is the main offense. Of course this ruins the game but it is clearly the worst kind of cheating: to rub out your opponent, rather than beating him or her.